Originally made in 17th and 18th century Korea and evocative of a full moon and the circle of life, the Moon Jar has today achieved almost mythological status and has inspired many generations of ceramic artists. In honour of this iconic object, Taste Contemporary Craft presented ‘Moonstruck’, an exhibition featuring the work of 3 internationally renowned ceramic artists. 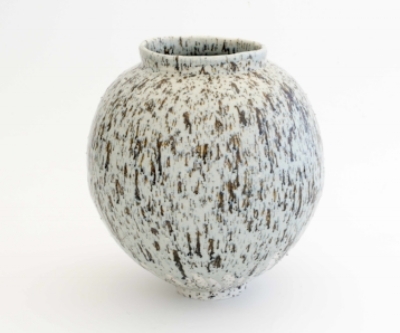 Korean born Dae-sup Kwon is widely recognised for his traditional and unparalleled interpretation of the Moon Jar; Adam Buick’s creations form a narrative that conveys a unique sense of place while Akiko Hirai’s deeply textured works focus on the interaction between object and viewer. 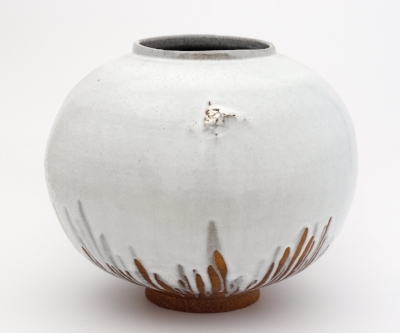 Dae-sup Kwon has devoted almost 30 years of his life to the creation of the Moon Jar and is considered its latter-day master. The complexity of creating these extraordinary works; the long firing time, high kiln heat and meeting Kwon’s exacting standards, all conspire to make his Moon Jars exceptionally difficult to produce. Typically, he is left with no more than 4 to 6 works a year. Kwon received his BFA from the Hongik University, Seoul, South Korea in 1979. His has been exhibited widely and is included in many collections. Akiko Hirai originally studied cognitive psychology in Japan before moving to London in 1999. She then studied ceramics at the University of Westminster before transferring to, and subsequently graduating from, Central Saint Martins in 2003. With a practice that centers on the Japanese tradition of allowing the clay to show how it wants to be fired, Akiko Hirai's work focuses on the interaction between object and viewer, allowing the viewer to interpret the language of the work in their own way. She has received international acclaim for her unique organic forms, in particular her Moon Jars, which are a combination of both Japanese and British studio pottery. Adam Buick studied Archaeology and Anthropology at the University of Wales before embarking on a Ceramics Design and Skills course in Ireland in 2004. He uses the Moon Jar form as a canvas to map observations from an ongoing study of his surroundings, incorporating stone and locally dug clay into the work to create a narrative that conveys a unique sense of place. The use of local materials is integral to his work, reflecting a personal relationship with landscape, the materials within it and his past experiences from where materials were collected. His work is in a number of public collections including the Devonshire Collection and the National Museum Cardiff.